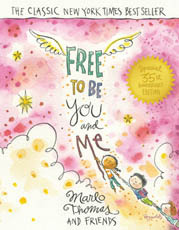 This is the book we all know and love by Marlo Thomas and her friends–brought to new life with brand new illustrations to captivate and inspire a new generation of readers on a journey of the heart. Whether you are opening Free to Be . . . You and Me for the first time or the one hundredth time you will be engaged and transformed by this newly beautifully illustrated compilation of inspirational stories, songs, and poems. The sentiments of thirty-five years ago are as relevant today as when this book was published. Celebrating individuality and challenging stereotypes empowers both children and adults with the freedom to be who they want to be and to have compassion and empathy for others who may be different.